The Kaimai Café and Store is all about a celebration of cheese. The focus has been on making the café experience memorable. The Kaimai store is stocked with all of the delectable Kaimai cheese and the friendly staff are able to answer any questions you may have about the cheese. You can of course purchase the cheeses manufactured on site, at the Deli Store pre-wrapped, or cut and wrapped to your specific requirements. The store also stocks a range of delectable cheese accompaniments, such as Kaimai Honey and other local gourmet items. The café & store are open seven days a week* from 8.00 am until 4.00 pm (the kitchen closes at 3.00 pm) and has a comprehensive menu and wine selection for your enjoyment. We update our menu regularly to utilise fresh seasonal ingredients, and can cater to any dietary requirements such as gluten free, or vegetarian. Kaimai is also able to cater for any special function you may have - just call or email the café for any booking enquiries. 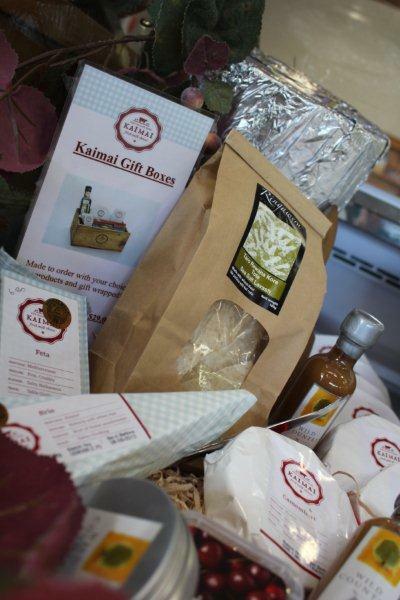 At Kaimai we have a wonderful range of gift baskets and boxes available. And if we don't have one that suits your requirements we will happily make you one up to order. Just pop into our cafe and ask at the deli counter.